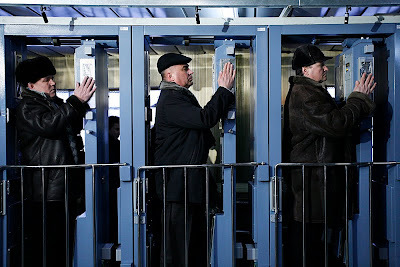 Contamination checkpoint at the Chernobyl plant. At the end of the day, workers check their hands and feet for radioactive contamination one last time before boarding the train home. 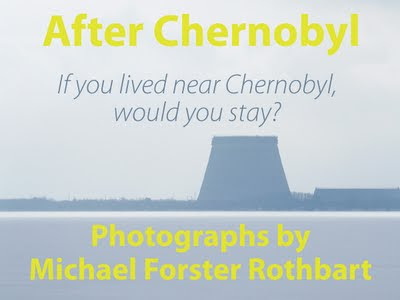 My Chernobyl photos will be screened tomorrow night (Feb. 21) at the Montshire Museum of Science, in Norwich, Vermont. Sunday's event is a reading of the play Voices from Chernobyl, based on the powerful book of reportage by Svetlana Alexievich. Alexievich, a journalist from Belarus, spent years interviewing Chernobyl evacuees, liquidators (veterans) and scientists. She weaved together an incredible collection of first-person stories. If you are interested in Chernobyl, or nuclear power in general, this is the first book to read. I recommend the 2006 English translation by Keith Gessen. The play is part of the noisy debate Vermont is having about the future of nuclear power in the state. The Vermont Legislature will vote next week to either relicense or decommission the 40-year-old Vermont Yankee nuclear power plant near Brattleboro, VT. 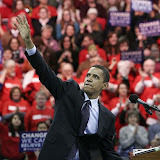 In the past two months, there have been revelations that radioactive tritium has leaked underground below the plant. The Sunday event starts at 7 pm at One Montshire Road, in Norwich. More details here. 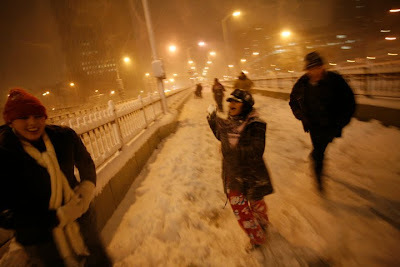 Last night I walked across the Brooklyn Bridge in the blizzard. Slowly. With my camera. It was, how shall I put it, a little bit on the chilly side. What amazes me, however, is that I was not the only one out there in the gale. There were joggers and pedestrians and other photographers. All of us nuts, every one. 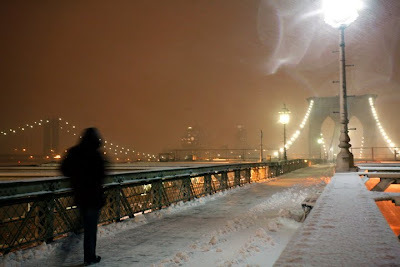 A solitary hardy pedestrian crosses the Brooklyn Bridge despite blustery winds and icy blowing snow. By sunset on Feb. 10, 2010, 7 inches had fallen in Manhattan, although this was enough to slow transportation across the region. 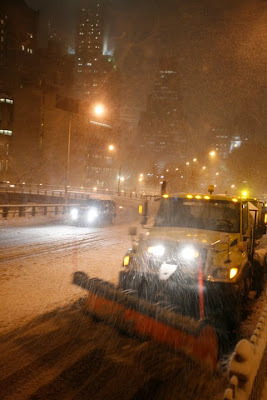 Street crews were working overtime to keep roads clear, with snowplows working on the Brooklyn Bridge 3 at a time. 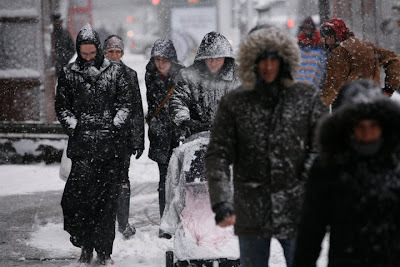 Pace University freshman, including Twinkle Vakharia, center, play in the snow at the base of the Brooklyn Bridge in Manhattan, before returning to their dorm for hot chocolate. Today New York City took the day off. Except the photographers. The streets were filled with snow — and sledders and shovelers — as the city celebrated a snow day on Feb. 10 with a rare school closing. Two girls duck under a bridge out of the snow as they take a break from sledding in Riverside Park in Manhattan. 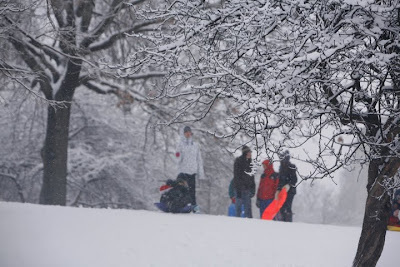 Sledders of all ages filled the hills in Riverside Park. A man pushes a stroller through the snow across 78th St. in Manhattan's Upper West side. 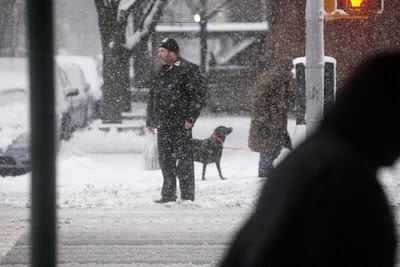 Alistair Stewart waits to cross Amsterdam Ave. in the snow. 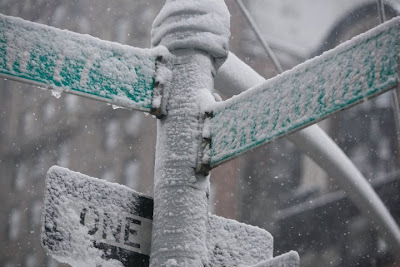 A street sign at 77th St. and Broadway is barely visible beneath the snow. 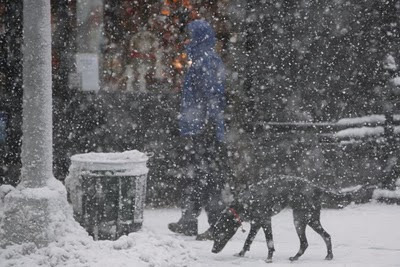 The snowfall was heavy at times, although accumulation was less than the predicted 12 to 18 inches; by 4 pm, 7 inches had fallen in Manhattan. 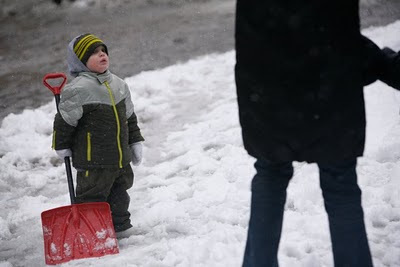 Liam Emerson, age 2, tries to help shovel the snow at the 72nd St. subway station. And now I've warmed up and I'm headed back out for more. I'm in New York city this week, meeting with a bunch of interesting people. But in between, I'm finding time to take some snapshots. I am reminded why people get addicted to street photography here. The city offers up an never-ending supply of little personal dramas to witness. 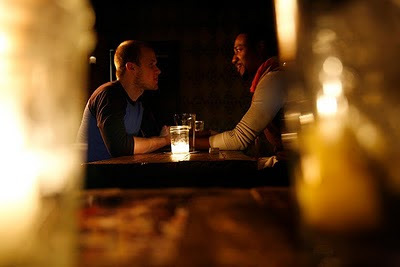 Kendall Maxwell (right) and John Doe flirt during a date at BAU bar in the East Village of New York City. (Doe requested that his real name not be used online). At 2:48 am, Anna from Harrisburg, PA, is drunk as she rides the 1 train uptown to Penn Station, talking about how she hates New York rats, and New York in general, while her boyfriend Zach tries to sleep it off. This collage was an experiment, to see how the frames looked pieced together this way. Graphically interesting, but I don't think it tells a story any better than the best frame does by itself.